Journey South News will be posted on Fridays: Sep. 2, 9, 16, 23, 30, Oct. 7, 14, 21, 28, Nov. 4. ...or until the monarchs arrive in Mexico! Sanctuary trees are filling with butterflies as millions of monarchs pour in from the north. Why do they migrate to this part of Mexico? What’s so special about it anyway? Explore maps and photos and form your own theories. When Journey North begins again next February, we’ll take a close look at the monarch’s winter habitat and how the butterflies are adapted to survive there. To prepare, collect weather data from the region once every month. Teachers: Try these activities and journal pages to assess students' understanding. Also: Welcome to New Participants! Join us in February, 2006! Las primeras mariposas monarcas han llegado! The first monarchs have arrived! After crossing half a continent, the monarchs must strike a finish line about 60 miles wide. 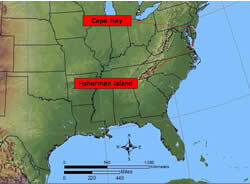 Another surprise this week: monarchs were reported from two separate islands in the Bahamas! Still no monarchs, says Estela Romero, who's watching and waiting from her home near the sanctuaries in Mexico. Like clockwork, they've arrived at the same time every fall since ancient times. They represented "for our ancestors in pre-Hispanic times, the souls of the dead coming back to earth to be for short time together with us," says Estela. Meanwhile, monarchs continue to stream down from the north. Late migration is a risky business. Take a look at temperature maps. When and where is it too cold or dark for a butterfly to fly? While we wait for the monarchs to reach their winter home in Mexico we wonder, will they find it this year? Here is a huge NASA image of planet Earth floating in space. Can you find the monarch sanctuaries? This week, learn the geography monarchs know by instinct. The migration is at its peak in Texas! Last week monarchs were "streaming south" and "sailing on northeast breezes." There were "hundreds, if not thousands" and they were "anywhere, anytime we looked up!" High-flying butterflies were floating past windows in downtown Dallas and the town took notice. How high were they flying? 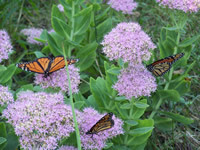 "Spectacular sightings in Texas this week, as monarchs move closer and closer to the Mexican border in massive numbers. "The sound of the fluttering wings was louder than you might think a butterfly flap to be!" said a woman who saw "zillions" in San Angelo. Do monarchs cross Texas on two monarch flyways? Watch today's migration animation and see what you think. "Here they come!" one person called to the next as the monarchs moved with the wind across Oklahoma and into Texas this week. "Finally, monarchs everywhere on the Virginia shore," came the word as a huge wave of monarchs swept down the mid-Atlantic Coast. How fast can monarchs migrate? As monarchs pass over your head on their way to Mexico you may wonder how long their trip will take. Where will the butterflies be in a few hours, days, or weeks? The recovery of one tagged monarch reveals some clues. The monarch migration picked up in the East last week. Butterflies passed at 296/hour in Cape May, NJ and the season's first wave reached Dr. Brower's mountaintop garden in Virginia. 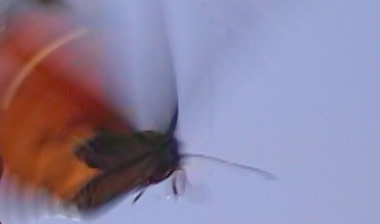 How long can a butterfly fly before running out of fuel? Take a look today at the energy costs of flight. A butterfly garden can be an important place for a monarch to refuel. Find out how you can help habitat on the monarch migration trail. "Amazing!" "Wow!" "What an incredible sight!" came the word from the Midwest on Wednesday the 14th as this fall's first classic cold front swept across the region. How many monarchs per hour did each observer see? Learn about "migration rate math" and predict who will see the record flight in Fall 2005. Hurricanes are among the hazards monarchs may face as they migrate. This week: a tagged monarch tells an uplifting story of survival. If Hurricane Katrina carried this monarch 165 miles in the wrong direction, could the wind carry a monarch across the Atlantic Ocean? Compare a monarch’s weight to a scrap of paper and consider the role wind plays in a butterfly’s daily life. Migrating monarchs rest at overnight roosts at the end of the day. What can we learn about their migration patterns from their resting patterns? Also this week: Find the monarch's winter home in Mexico and your own home on a satellite map. Then zoom-out and fly like a butterfly all the way to Mexico!